The announcement is the latest in more than a dozen stadium proposals that have come and gone in the meandering, two-decade effort to bring an NFL franchise back to the nation’s second-largest media market. But Kroenke’s move marks the first time an existing team owner has controlled a local site large enough for a stadium and parking. What’s more, Kroenke, a billionaire who built his fortune in real estate, has the ability to move quickly. The Rams can choose later this month to convert their lease in St. Louis to year-to-year. The Rams declined comment on any plans to move, but it’s no secret that the team is unhappy in the Edward Jones Dome, which is outdated by current NFL standards. The San Diego Chargers and Oakland Raiders are similarly unhappy in old stadiums that don’t offer updated amenities. NFL Commissioner Roger Goodell said the league would not be accepting relocation applications for the 2015 season. So the earliest any team could move would be 2016. Any team that moves could play in a temporary venue, such as the Coliseum or Rose Bowl, until a new stadium is constructed. The developers said no tax dollars would be used for the construction project, including the stadium. The group plans to begin gathering signatures soon for an initiative that would place the entire project on the Inglewood municipal ballot in 2015. Inglewood Mayor James T. Butts Jr. said he was “extremely supportive” of the ballot initiative that would add the sports and entertainment complex to the already-approved Hollywood Park development and speed construction. The stadium could be completed by 2018, the developers said. The owners are calling the combined Kroenke and Hollywood Park projects the City of Champions Revitalization Project. Wilson Meany, a San Francisco firm, is heading development of the site. Wilson Meany is also developing Bay Meadows, a former horse racing track in San Mateo. The developers want to restore Inglewood to prominence as a sports and entertainment hub. Before Staples Center was built in 1999, Inglewood’s Forum was home to the Los Angeles Lakers basketball team and Kings hockey team. The Forum was recently renovated to be a pure music venue. Since the Raiders and Rams left after the 1994 season, the threat of moving to Los Angeles has been used as leverage by NFL teams looking to get stadium deals done in their current cities. In that sense, the region has been more valuable to the league without a team than with one. Because stadiums are so expensive, now routinely topping $1 billion — and because there is no appetite in Los Angeles for public funding — the NFL has a great deal of influence on which team or teams ultimately move into the market. The league can issue loans to help pay for a stadium and award Super Bowls, which are used as a financing mechanism. Any relocation must be approved by a three-quarters majority of team owners. 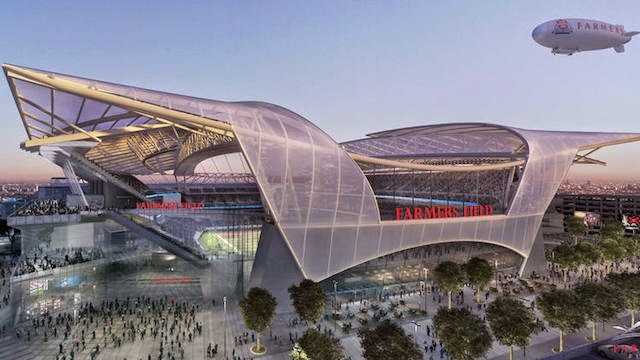 As it stands, Los Angeles has two sites with the legal, political and environmental clearances for NFL venues: the Farmers Field plan downtown and Ed Roski’s proposal in City of Industry. The stadium entitlement process, which invariably involves resolving lawsuits filed by people opposed to a given project, typically requires at least a year, thousands of pages of documents, and millions of dollars in legal and consulting fees. 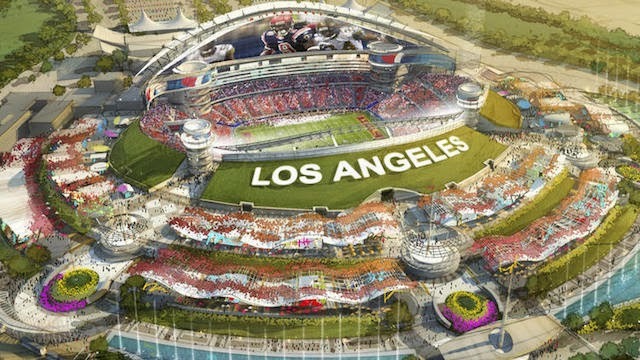 The developers of the proposed downtown Los Angeles stadium, entertainment giant AEG, have a few more months to find a football team under an agreement with the city. AEG has vowed to build a stadium called Farmers Field along with a new wing for the city’s convention center. The center’s obsolete West Hall would be demolished to make way for Farmers Field. Wal-Mart originally owned the 60 acres adjacent to the Forum but sold it to Kroenke after failing to get public approval for a superstore. Madison Square Garden Co., which owns the Forum, had planned to buy the lot in order to acquire more space for parking and possibly additional development, but Kroenke beat them to it. Kroenke is a former Wal-Mart board member and husband of Ann Walton Kroenke, daughter of Wal-Mart co-founder Bud Walton. Forbes magazine estimates Kroenke’s net worth at $5.8 billion — not counting his wife’s $5.6 billion — making him the NFL’s second-richest owner to Seattle’s Paul Allen, the Microsoft co-founder who is worth an estimated $17.1 billion.